In an email to his cousin Leigh Henson on 6-3-01, Jerry offers a little background for his interest in writing. "In 1985, I was without work for several months because I was laid off by an employer, and then by choice as my wife suggested I take some time off anyway, and so I attended Elgin Community College for a few courses. (By the by, Paul Hegele was an instructor in the Business Department. He lives in St. Charles ...about 10 miles south of here. I attended a one-day seminar sponsored by one of my employers, which he taught in 1978. We talked at the last reunion. He is retired.) Well, writing was the course I liked the best. It takes so much time. I never stayed with it. I guess my impatience rules. I did my best writing when I sent letters home from my military days. My mother kept all of them; however, some were inadvertently lost, and there are gaps, but some of the stuff was a real weekly chronological documentation of one soldier's life." All material copyrighted by Jerry Gibson. Hay baling season during the summer of 1959 was as typical as any Logan County Illinois, the days were hot and humid. Jon Diers, Ron Castor, and I would wait at Dial & Jones Texaco for our 4th baler and leader, Carson Culleton, to pick us up in his car, so we could ride dusty hay wagons and stack hay in stifling hot barns and sheds. Our reward for working for John White, George White's son, was the best pay, kind people to work for, Mrs. J.White's lemonade, tea, sandwiches and cookies during breaks in the shade. Possibly the best reward, for me, was the memory of the companionship of working together with those guys. Diers could unwittingly get in enough trouble on his own, but Castor was always 'helping' some how. One day, George volunteered to drive the four of us in his car to the next site where we to put up hay. One of the reasons George White was financially successful may have been because he knew how to use his money. For instance, his 1953 Cadillac doubled as his pick up truck by removing the rear seat. By omitting this cumbersome object, George now had practical room for hoes, shovels, spades, fence wire, hammers, and boxes of hardware items needed for farm work (material most likely purchased from Lauer's Hardware). Now, if this 'pick up truck' would not have had a car top on it...there would not have been a problem for Gibson and Castor. Since Culleton and Diers were previously aware of this vehicle, they landed in the front seat next to George. In the back seat area ,we could not sit on anything, so we had to crouch in a duck walk position for about 5 miles over gravel roads, farm lane ruts, and pasture pot holes to the next work site. So each bump resulted in our backs or heads hitting the top, or our rumps stabbed by garden tools. Plus, the back of the back seat was removed, allowing the dust from the tires to roll into our part of the compartment. I don't remember if we ever got back at Carson for his quick move, but Diers was reminded, by us, every time George was in earshot, with, "Diers, if there is a way to do it wrong...you'll figure it out." It came about when the vehicle approached a long gate blocking the entrance to the field where the hay shed was located. George told Diers to 'Open the gate.' Now this may seem a moot point to some, but to George White it was a big deal. Well, to any farmer who does things his own way it is a big deal. The gate was hooked at both ends. Diers headed for the end closest to him.....BUT it was the WRONG end!!! Yep, George wanted the other end unhooked. George's voice was shrill and weak so Diers couldn't hear him, over the engine noise, that he was at the wrong end of the gate. George wasn't as spry and agile as he once had been so it took him many seconds too long to exit the car to get Diers' attention. Diers unhooked his end of the gate; the gate proceeded to fall to the ground in a huge billow of dust (which slowly settled all around George). That gate was heavy to lift back upright especially when we were weak from suppressing the laughter we wanted to release at the scene of the heavy set, red-faced, coveralled, straw-hatted individual shouting at a skinny city kid about which end of the fence gate to open. Pete wanted me to tell you that yesterday morning as I was doing some outside work, I walked near our decorative bird house which hangs from the garage side of our pergola. I looked up and found a sparrow with its head wedged into the entrance hole. The poor thing was stuck with all of its body on the outside and its head inside the house. Well, my first reaction was to run inside to get Pete because it was such an unusual scene. She was painting our bedroom closet, and she wasn't too thrilled at my request for her to stop immediately and look out the window at the plight of a bird. At my request, she grabbed the video cam. I rushed back outside with the Polaroid to make a still record of the event. By this time the bird [I don't have any idea how long it had been stuck] is running out of gas. Pete suggested I take the birdhouse, and the bird, off the hook so I could work with getting it unstuck. The bird is so pooped it doesn't give me much of a struggle. It did, however, have to wait while I donned gloves and protective glasses. So I gently wrapped my hand around both wings and legs to see if maneuvering my index finger to its neck would help the little rascal out. Geez! I did not realize what a fragile creature it is. I immediately let up for fear of pulling its head off or injuring it to incapacitation. Now, I look to Pete for help. "What should I do? ", to which she advises me that either I do something or the bird dies in the hole. Great. So I set the birdhouse and its part occupant down to try and decide the bird's fate.....and the damn thing pulls its head out and flies off in a noisy flurry to a large bush at the far corner of the garage! As it peeped and twitted to the other birds in the bushes, I'm sure it told its fellow birds I tried to kill it by first catching it in a torturous trap and then separate its little birdy body from its little birdy head. A recent correspondent reminded me of my then life's ambition to be tall enough to detassel corn. Oh, to reach the required height to be accepted by Fuller's so I could earn my own spending money (and maybe be taller than the girls my age), at last. First, I had to obtain a Social Security number. Now, that was a big deal in 1954. I made sure I had 'Jerry' on the card. I detested Jerome. Little did I foresee the hassle that I would have many years later trying to get the legal thing straightened out with Uncle Sam. What a privilege to wait on Hodnett's Corner for the truck to pick me up so I could dress in clothing, fit for winter, to protect me from corn leaf cuts, pollen down the back of my neck, mud inches thick on my boots, and a skin-burning sun. Yeah, I walked the rows. I think I only rode once or twice. Anyway, the most vivid detasseling story I have is Jim Cave's adventure into manliness. If the boy crews were lucky enough to work in the same field as a girl crew, and the boy crew were even more fortunate to take a break at the end of the rows when the girls arrived at the same time...then it was a signal for the boys to show off. Cave whipped out a plug of tobacco from his shirt pocket while all watched. He was so excited he had a coed audience, that he inserted the entire plug into his face and somehow moved his puffed out cheeks into a chewing motion. As the mess in his mouth began to expand, the boy's side wondered how much longer before the inevitable expulsion and the girls, sensing something not good was about to be seen, hurriedly prepared to go back to the wet, insect-infested corn stalks. Noticing the quick preparation by the girl crew, Cave chewed faster to get an impressive wad to prove his manhood. As he inhaled to muster a most man-like scene, he quite underestimated the size of his mouth and size of the contents. As physics prevailed (in order to launch, as it were) in the amount of air needed to accomplish the deed, he sucked most of his hard chewed labor into his stomach. The boys were in shock, the girls were already in the corn and Cave was yelling for water. Now, this was not a real smart request, because he immediately got his wish granted. During the late 1950's, Carson, myself, and a lot of guys had summer jobs with the State of Illinois, working on road clean up crews...cutting grass with hand sickles or long scythes, redirecting roadside ditches with shovels after heavy summer down pours and mudjacking. For a number of geological reasons the highway top surface would sink at a certain location....many times at the approach to a railroad track that crossed that portion of roadway. It was the State's responsibility to bring the highway up to 'grade' or level with the tracks. In comes the mudjack, which is a device consisting a gasoline engine which in turn forces a mixture of clay, water, and some sand through a two inch hose into two inch holes drilled at strategic sections of the sunken road. My memory vividly sees the impish grin on Carson's face when the road foreman would announce at the morning pre-workday meeting that today was mudjacking day. Man, Carson would smile all the way to the work site while us veterans would be silently wondering to ourselves of his choice rookie operator au jour. You see the garage foreman, Ed Masterson, knew of Carson's game and he always appointed Carson as the 'instructor'. Carson knew this procedure and he knew the ins and outs (so to speak) of how to accomplish this method. I do know Carson and Ed had a motive. I know it was great sport and I know Carson liked the limelight. Hell, it gave us all levity and an esprit de corps.....naw...it was good ole boy stuff pure and simple. 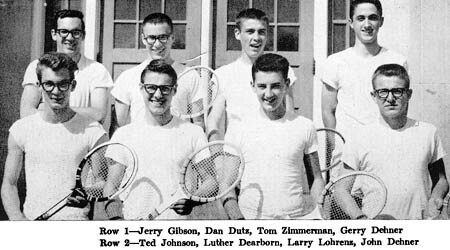 The traveling tennis squad consisted of six players. Whether that was Big 12 rules or all that we could fit into Royce's (again, no disrespect but we all unofficially referred to him as such) Chevrolet station wagon. The road trips to Bloomington, Springfield, Decatur and surrounding conference schools were painfully long mainly because Royce wanted to set a perfect example by practicing EVERY driver's training law written, since he was the LCHS driving instructor. I must note the mechanical data of this period automobile which doubled as the driver's training vehicle: straight six cylinder engine propelled by a clutch-actived three speed column mechanical shift. Speed and propelled may be oxymoron's, here, because Royce did not exceed the posted limits. Seating arrangement was designed by Dan Dutz who was the number one player and had shot gun front seat. The number 2,3,4, members Luther Dearborn, Gerry Dehner, and Thom Zimmerman sat three across in the second row seats. The back of the station wagon belonged to the number six player, Steve Schreiber, who had to lie in curled position around the rackets and equipment in the far back compartment. The number five player (me) was in the front row suicide seat where the exposed rearview mirror was at the vulnerable forehead level. In those days rank had its privilege. In his every effort to set a prime example as an instructor and educator to us as future drivers, Royce would shift the wagon with PRECISE engine speed, clutch engagement, and gear shift movement through EVERY gear EVERY maddening start up. So instead of encouraging him to move a little faster to get us home quicker, in our teenage mind's it was better to make a joke of his efforts. With a lot of encouragement from row two passengers and the idea seeded by mister shotgun rider, Dutz and I would subtly move heads when Royce shifted which would make him think he had not shifted smoothly. So the long story shifts down: Mr. R shifted the vehicle in a perfectly acceptable diving school manner and we passengers made it seem like he was not so proficient. This doesn't pertain to this article, but who will forget the waving neon figures, the service station attendant and the waitress on top of the Tiz-Rite at the four corners? Since you asked about the brief stint I had helping out in a carnival, I must include some Logan County, Illinois, background before I get to the point. Lincoln is the county seat and is located 25 miles northeast of Springfield on what is now I-55 which once was the famous Route 66. Before that it was Route 4. This easy access route to the state capital made it possible for a lot of folks in Lincoln to procure employment compliments of the taxpayers. The one catch was that you had to have a profound affiliation with either the Democratic or Republican Parties, as a good portion of the jobs were 'political.' For whatever reason my dad and his brothers had always declared Republican in the primaries and so our family was established on that side of the political fence. During my high school years the Secretary of State was Republican, and one of the responsibilities of that office was the 400-plus acre Illinois State Fair grounds. We weren't as dumb as we looked so we asked him what was available. Turns out there were several openings for night grounds cleaning crews and a few for ticket takers on the Midway on both the day and evening shifts. Most of us were broke and so he had plenty of takers and we settled in dividing up the jobs. It was really a very orderly process because we were all life long friends and there wasn't any bickering over who took what. Surprisingly, the groundskeepers went first and that was ok with me because I didn't have any transportation. I did have a better chance at the day job of ticket taker so I got that with a guy by the name of Tom Werth. His dad was a big-time farmer and I figured I could get a ride with him. I knew there was no chance I would have a ride as we only had one car, a 1954 Packard, which was, unfortunately, a lemon. I worked with Tom on his grandfather's farm painting a barn and white fence, which must have been two hundred miles long, the previous fall. Since we knew each other fairly well, I was confident this adventure was going to be a breeze. We had to report to Springfield a few days prior to the fair opening day to get our assignments, orientations, and badges. Tom drove. On the way back from Springfield, Tom got a speeding ticket and as punishment, his dad took away his driving privileges and told him it was his responsibility to find a way to work. This is where the 'breeze' ended and ten days of 'headwinds' began for us to arrive at our job sites on time. Since we were the only two from the area on this shift and this assignment, we were reduced to the Greyhound Bus lines. The only bus left Lincoln for Springfield just before 6:00 am., daily, from the Maid-Rite all-night restaurant. This was about the only traveling luck we had during the ten-day running of the fair. Our job assignments were ticket takers for the carnival rides and shows on the Midway which was located in a natural land indentation on the grounds referred by all as 'Happy Hollow'. Neat name but during the hot humid days of mid August, all of this stuff was trapped with the heat from ride generators, grease pit carnival food stands, and over- heated human beings waiting in long lines to board rides. Oh, yes, and if it rained, and more than often than not August rains are downpours, and the topographical lay meant that all the run off water ended up as 'Lake Happy Hollow'. Maybe it should have been 'Electric Lake' because of all the cables running from the generators to the rides. Each day the "Call" or opening was staggered; sometimes 9:00 am; one day it was 11:00 am; and so Tom and I had time to get some sort of breakfast and find our friends for their stories from their nightly clean up jobs, until time for us to report for our assignments. At least the bus drivers were always helpful by making a special stop near a gate for us, with our sad story, of course. We always managed to catch the evening bus but I don't know how. So our job was to deposit the sold ticket stubs into a locked ticket box, which was given to us at the beginning of each shift. That box stayed with the ride or sideshow through the next ticket takers' shift and then it was turned in when the carnival closed. The purpose of this tabulation was to insure that the agreement between the carnival operators and the State of Illinois received equal half share of the receipts. The fox was watching the hen house. Now then, for all of the hours of listening to mixed sounds of 'Come see the Three Legged Man', 'Jo-Jo the Dog Face Boy', (who I did without asking, thank you); 'Miniature Horses so small you will not believe it you MUST see them with YOUR own eyes'; 'They are Rolling Thunder! Motorcycle Daredevils riding on walls of Death!' over and over and over, the same blaring, scratchy, repetitious voices coming out speakers not far from our sun-drenched ticket taking posts; plus there were few breaks from this din as the utility men who were assigned to relieve us usually got stiffed by a lot of the guys they relieved, we were paid the handsome net wage of: eighty (80) bucks. As I scanned your recent Lincoln, Illinois posting, I was reminded of several things that many Lincolnites may have forgotten or just fail to mention. Since most of us draw on personal experiences stimulated by Fred Blanford, David Armburst, yourself, and the many Lincoln historians quoted by you, I must offer readers the jobs I acquired from the State of Illinois. Working for a State of Illinois road repair crew based from the Lincoln facility, noted by your gracious posting of one of my writings, was my first job with political ties. After that stint ended, I interviewed and was accepted for a job in the Illinois State capital. For many months I rode with Lincolnite Paul Leo Jones from Lincoln to Springfield. Many folks from Lincoln commuted on the old Route 66 just as Leo did. He was more efficient than any bus or train operation. He picked up his riders at a designed time in Lincoln and was always on time at the Springfield locations. He worked with his brother operating a floral business in Springfield for many years and drove Route 66 five and half days a week without fail. Leo and many Lincolnites depended on the salaries provided by the State. Many other Lincoln occupations, depended on commuting as a necessity. Many readers probably have more commute stories about Route 121 to Peoria and Decatur for work. Lincoln was a bedroom community long before the larger metropolitan areas invented the term. Lincoln was the perfect hub of working class ethics on the spokes of larger job bearing cities by its location being twenty five miles from Springfield and Bloomington, thirty five miles from Decatur, and forty some miles from the various Cat plants in the East Peoria area. Shortly after WWII, my dad, Ted Gibson operated a door to door bread/pastry service in Lincoln for Community Bakery out of Springfield. Every night he had to drive to the Springfield bakery on Route 66 in the bread truck to pick up the next day's orders. During those days 66 was TWO lane. My mother and I would accompany him on many of those trips and I learned every manufactured auto and truck from that era by name and year. Probably many guys from the middle '50's who played Little league remember our summer bus trip to St Louis and our excited waving to the contractors and workers who built the four lane 66. 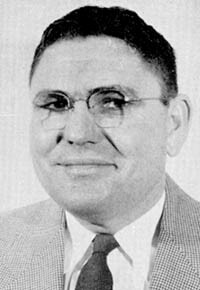 Some of the men who built the road were fathers of the boys on the bus. Great fun. I must remind readers of the lost art of small town respect for fellow residents. This concept is completely gone from today's urban societies. Since a great majority of Lincoln's working population relied on shift work salaries (before heavily insulated homes and air conditioning), many mothers reminded their children to play quietly and respect those workers who needed sleep time during the daylight hours. So many things that were second nature, small town-ways-of-life are now lost in the 'hurray up' society of today. Along with this walk down my memory lane of past employments, I must take time to reflect at my good fortune to have been a part of this melting pot of Americana and that the lessons of sound work ethics produce positive rewards. Leo Jones was strict with his transportation business. The revenue he got from that venture not only paid for his gas but helped him trade for a new Oldsmobile every 18 months. The man was like clock work with his pick up and delivery (if you were not ready, you did not get a ride). Also, he had a designated seating arrangement. The rider had to sit in the same seat location every trip. Usually he had five riders. During the few months I rode with him there was a single woman who lived with her mother on 4th street, Ken and Stella Mays, and for a short time, John Burt. Other names fail me now. Of course, I eventually acquired an apartment with Burt and a couple of other guys in Springfield. Hence the 2 Brothers stories. Jerry invites comments, questions, and suggestions for other stories: j18gib@sbcglobal.net. In May, 2007, as Jerry was looking through some boxes left to him by his parents, life-long Lincoln natives Ted Gibson and Eleanor Hoblit Gibson, he discovered this very rare memento of the 1953 Lincoln centennial celebration. Jerry had not seen the banner for many years and assumed it had been lost. He has generously donated this banner to the Logan County Genealogical & Historical Society (LCGHS) on Chicago Street (rather than sell it on eBay). Just before he went to the LCGHS to donate the banner, he took it to show folks at the Courier. There, he was complimented for his donation to the LCGHS and was told that the Courier would probably announce this donation in the Gems section of a forthcoming issue. The Courier carried Jerry's story on June 4, 2007. I have written the LCGHS to suggest an account of how the banner came into the possession of the Gibson family and Jerry's donation of it would make a good, major feature story in the Society's newsletter, Roots & Branches. The banner is displayed in the Lincoln Room of the LCGHS offices on Chicago Street across from the railroad depot. "The banner is of gold fabric with blue lettering and border, and two and one half by three feet dimensions, and it hung over the thoroughfares welcoming visitors to this event. Since the inks used in those days were not the quality of today, there is some sun fade, but the lettering is still very readable, and the fabric is in remarkable shape. Jerry tells a most revealing story of how his father, Ted, acquired the 1953 Lincoln centennial banner: "Early one morning some time after the 1953 Centennial ceremonies for the duration were complete, I was with my dad when he was delivering bread ( I accompanied him a lot on his route). We saw two city employees taking this banner down from a wire above the street in front of a grocery store. Dad asked them what would happen to the banner. They said they weren't sure, but it would probably just end up in the dump. My dad muttered some words under his breath and asked them if he could have it, so they gave it to us. I think Dad found it hard to believe that Lincolnites would not be more appreciative of their town's history." "As a side note, I just wish I had discovered this before the 150th celebration parade as I would have hung it on the 1960's class sponsored float (remembering the old Rec building) on which I was an animated member." Leigh's notes: in today's communities we are used to seeing countless banners on streetlight posts. The photos I have seen of Lincoln's downtown streets taken during the centennial celebration show striped banners (no doubt red, white, and blue), but these photos do not show this banner. Thus, it truly is a rare find. 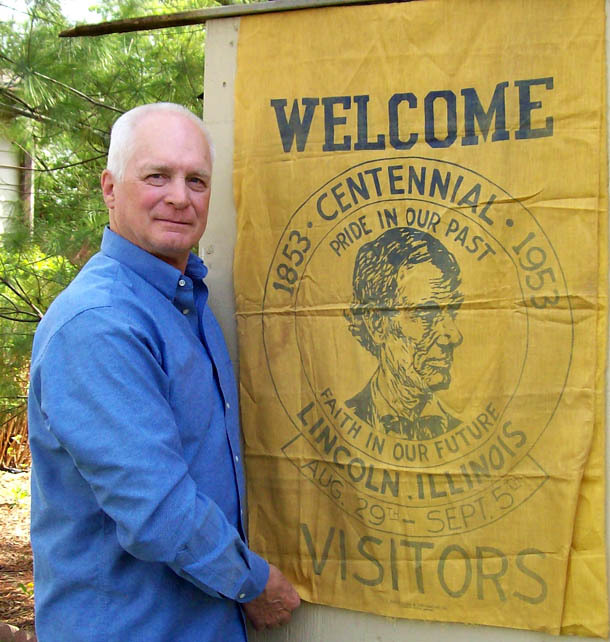 At his own time and expense, Jerry made a special trip from his home in the Chicago suburbs to Lincoln in order to donate this banner, and it surely must be regarded as a premium memento by those who administer and visit the Logan County Genealogical & Historical Society. Leigh's notes continued: For examples of how today's Lincoln community sometimes fails to preserve historic structures and sometimes succeeds, access key passages relating to "LJHS Building" and "Historic Preservation" in my review of Jan Schumacher's book, Glimpses of Lincoln, Illinois. Link to photographic historical essay on the 1953 Centennial Celebration of Lincoln, Illinois: http://findinglincolnillinois.com/1953centennial.html. Note: A black and white version of the photo above and related story of the banner are included in Leigh Henson's book The Town Abraham Lincoln Warned: http://findinglincolnillinois.com/townabewarned.html. Class Web site: http://findinglincolnillinois.com/lchsclassof1960/index8-06.html. Homepage of this Lincoln Web site: http://findinglincolnillinois.com.